What's special about this Sigvaris 242C 20-30mmHg All Season Wool Men's Knee High? Sigvaris introduces the luxury graduated compression socks. The Zurich Collection features graduated compression in a soft as cashmere wool sock. Luxurious graduated compression socks. knitted from Australian Extra Fine Merino Wool will keep your legs cool & dry no matter the season. Soft & comfortable, these socks are perfect for daily wear to keep your legs looking & feeling great every step of the day. Stylish! 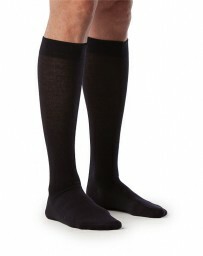 This pair of men's circulation socks are the epitome of softness, comfort and style. Made with Australian extra fine merino wool makes them ideal for all-season walking, running, or simply being on your feet for long periods of time, and their soft knit in band is sure to keep these support socks around your legs, but without that irritating pinching sensation. Stay Dry! Their innovative design features a thermo regulation for year round wear & keeping feet dry. Truly Effective! Medically proven to increase circulation from toe to your heart. Trusted by Physicians to reduce moderate venous disorders & spider veins. Ideal for those with sensitive feet, swelling feet, aching feet, and long distance travel. Sigvaris Medical - Zurich Collection. Luxurious Graduated Compression Socks That Energize Your Legs. Chaussettes Luxueuses a Compression Graduee Qui Dynamisent Vos Jambes. All Season Merino Wool Socks. Graduated Compression Socks, Medical Compression Stocking, Bas de compression medicaux, Calcetines de compresion medica. Sigvaris - Life for Legs. Knee-Hi - Jarret - Hasta la rodilla. Sigvaris 242C 20-30mmHg All Season Wool Men's Knee High.